Soon we came to realize that we also had lot of cables and had given no thought as to how to transport them. My aunt volunteered an old suitcase, and my mother suggested we could use some old pillow cases, so that’s how they traveled to the first show. Fast forward a few decades and virtually all my company’s gear goes in cases. Small items are stored in large rolling trunks and we even have a few empty cases available for miscellaneous stuff for specific gigs (i.e., DI boxes, tools, etc.). Taking the gear off the shelves, transporting it safely to the event site, moving it from the truck to the venue, packing it all up at the end of the show and getting back to the warehouse takes way more time and effort than the show lasts. A good production company must master logistics and be skilled in the management of getting equipment from point A to B (and back) safely and securely. The better organized a company is, the easier it is to pull a show, get the stuff to the gig and get it all back with efficiency. Organization starts in the warehouse. All inventory should be stored in a systematic manner so when it’s time to pull the gear for the next show, it can easily be found. Labeling the shelves and storage areas can help staff find items quickly as well as put them back items correctly. 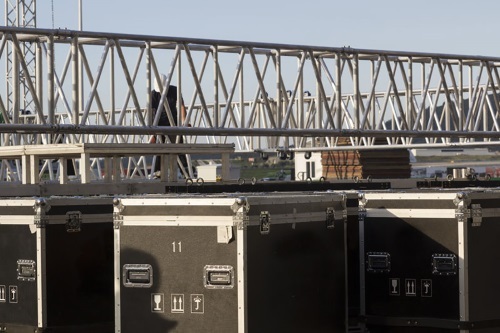 Even if an item always lives in a particular trunk or case, the container should be labeled so any temporary help or new stagehand can locate the item at the gig. Our method is to select a tape color for each show and put the show name and location on the tape. For example, the big trunk with the green tape that says “GSR Crystal” means it belongs to the Grand Sierra Resort’s Crystal Ballroom gig, while the trunk with the yellow tape that says “WED” goes to Alison’s wedding at the Peppermill Casino. In addition, we write the contents of each trunk on a piece of tape so that the crew knows what gear is inside which trunk, and at the end of the gig we can put all the gear back into the correct trunk for delivery back to the shop. To keep everything straight, a “pull sheet” is generated when we plan out the show. It includes all the pertinent gear, from loudspeakers and consoles down to interconnect cables, loudspeaker and power cables, snakes and so on. Then a technician pulls the gear listed on the sheet and gathers the equipment for an event in a “staging area” where it waits until it’s loaded in a truck. While we do a thorough check of all gear after each use, any pieces that have sat for a long time get checked out in the staging area before the truck is loaded. At this point we also plot the system’s signal flow and components, from microphones to clips to stands to cables to snakes to consoles, etc. We also pack a few “spares” just in case something breaks down at the show and/or in case a “plan B” is needed onsite. This includes items like a few longer cords, an extra loudspeaker and a “utility mixer,” all of which have saved the day at the show site.